We bought this beautiful boudoir chair at an auction for our unique furniture section. We knew nothing about this unusual chair, we saw it on the internet and found it very interesting. It is a small red feminine chair with a skirt, a rather unusual product. I knew nothing about it, just liked the look of it and bought it only by sight. After bringing it home we started to investigate, starting with a google search describing the looks and style. It turned out to be a antique boudoir chair which would fit perfect in our unique antique furniture category or unusual products. The upholstery is stapled at the bottom and the rubber casters are far to modern to be antique. But the base is very sturdy and looks hand made. So at this point it could be a modern copy or a reupholstered and restored antique. 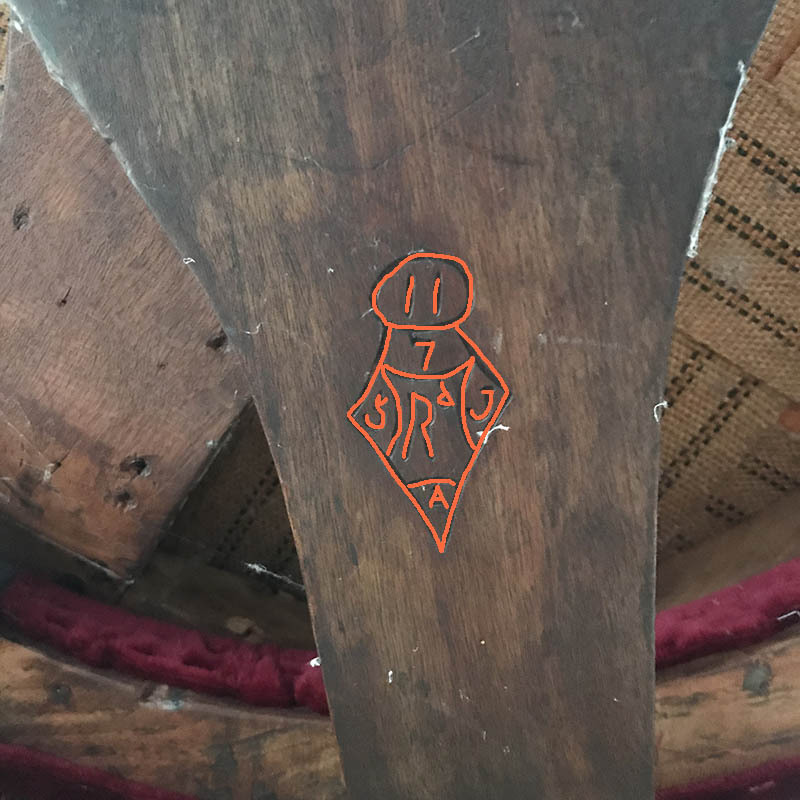 Then came the most promising part of the chair, at the bottom there is a diamond shaped mark etched in the wood. This mark is what makes it interesting. A quick search brought me to the website of Kovels,which told me that it is an English registry mark. Marks registered from 1842 to 1867 have a letter at the top and the marks from 1867 to 1883 have a number. So it is safe to say that the chair is made after 1867. At the Kovels website there are also different tables describing what the letters and numbers mean. The roman numbers in the top are the type of material. So our chair is made out of wood, but we did not need a mark to determine that. For the early period marks (1842 to 1867 ) the letter in the top of the diamond ( below the circle ) stands for the year the chair was made and for our period the day of the month. 7 – so the 7th of some month in some year. In the later ( our ) period for the parcel number. 5 – in our period, so chair number 5 made on the 7th of some month in some year. Going to the right side of the diamond and looking at kovels it stands for the day of the month in the early period and year of manufacture in our period. 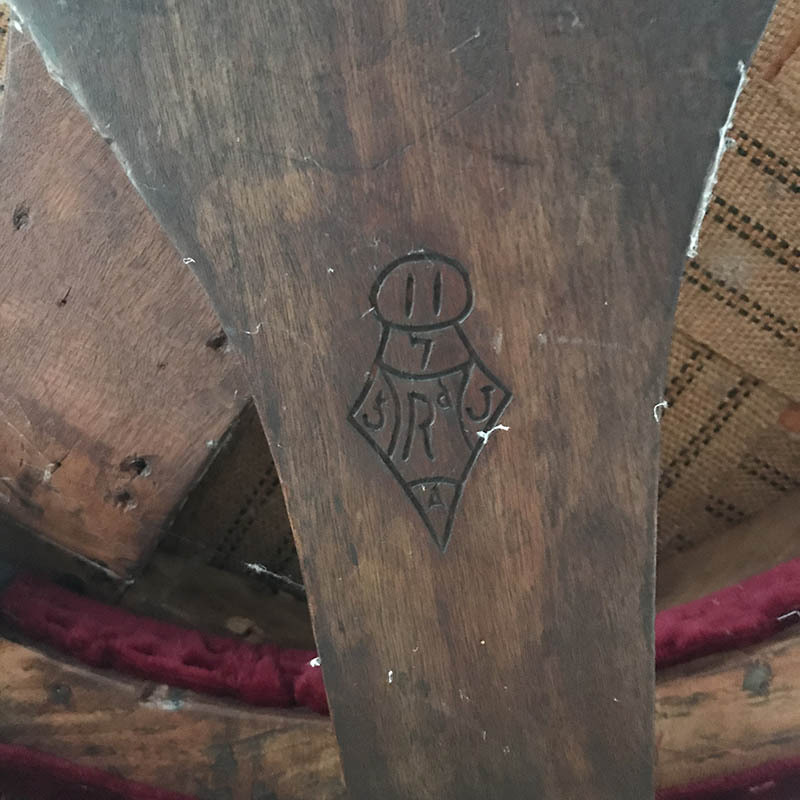 So our chair is made the 5th chair made on the 7th of some month in 1880. We now have one part left which is the bottom part of the diamond. For the early marks this stands fort he parcel number. Our period, the later period, it is the month. The table for the months has never changed and is still the same as the table above. We have an A which stands for December. Now the dating is complete. We bought an antique boudoir chair at auction that was reupholstered, restored. It was the 5 chair of a series and made on the 7th of December in 1880. Nothing much interested happened on this day except that Alexander Graham Bell was in some office giving his signature on a patent of the Photophone, which he believed to be bigger than his telephone. 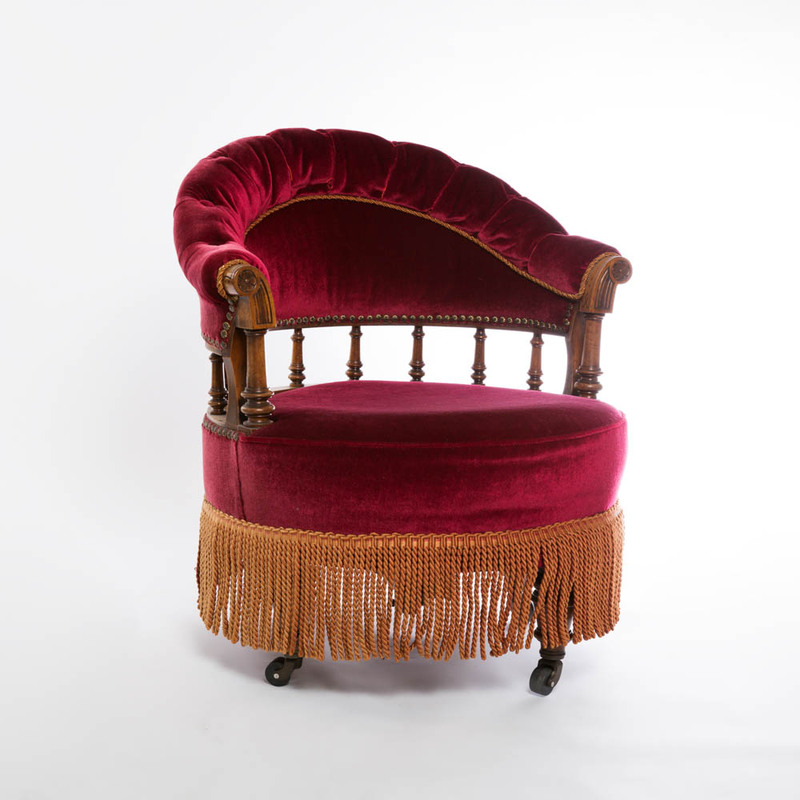 Should you be interested in buying the antique boudoir chair or dressing chair it is now for sale in our shop.